Severe air pollution episodes in Europe and the USA in the early- to mid-twentieth century caused large health impacts, spurring national legislation. Similarly severe episodes currently affect developing regions, as exemplified by a particularly extreme episode in January 2013 in Beijing, China. We investigated associations between this episode and medical visits at a Beijing hospital. We obtained fine particulate matter (PM2.5) measurements from the US State Department’s Embassy monitor and daily counts of all-cause, cardiovascular, and respiratory emergency visits, and outpatient visits from a nearby hospital in the Liufang Nanli community. We analyzed whether risks increased during this episode (with daily PM2.5 ≥ 350 μg/m3) using generalized linear modeling, controlling for potential confounders. The episode brought exceptionally high PM2.5 (peak daily average, 569 μg/m3). Risk increased during the episode for all-cause (relative risk 1.29 [95% CI 1.13, 1.46]), cardiovascular (1.55 [0.90, 2.68]) and respiratory (1.33 [1.10, 1.62]) emergency medical visits, and respiratory outpatient visits (1.16 [1.00, 1.33]). Relative risks of all-cause (0.95 [0.82, 1.10]) and cardiovascular (0.83 [0.67, 1.02]) outpatient visits were not statistically significant. Results were robust to modeling choices and episode definitions. This episode was extraordinarily severe, with maximum daily PM2.5 concentration nearly 22-fold above the World Health Organization guideline. During the episode, risk increased for all-cause, cardiovascular, and respiratory emergency medical visits, and respiratory outpatient visits, consistent with previous US-based research. However, no association was found for all-cause or cardiovascular outpatient visits. China-based studies like this one provide critical evidence in developing efforts regarding air pollution remediation in China. 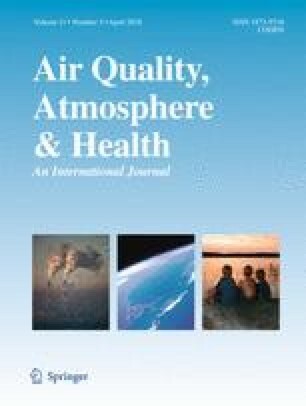 The authors acknowledge the U.S. Embassy in Beijing for publically providing the PM2.5 measurements used in this study and JL Peel and M Yan for helpful suggestions in interpreting results. This article was developed under Assistance Agreement No. 83587101, awarded by the U.S. Environmental Protection Agency to Yale University (ML Bell). It has not been formally reviewed by EPA. The views expressed in this document are solely those of the authors and do not necessarily reflect those of the Agency. EPA does not endorse any products or commercial services mentioned in this publication. This research was funded by grants from Colorado State University’s College of Veterinary Medicine & Biomedical Sciences (JM Ferreri, GB Anderson), National Institute of Environmental Health Science grant R00ES022631 (GB Anderson, RD Peng), National Institute of Environmental Health Science grant R01ES019560 (RD Peng), and National Natural Science Foundation of China grants 21277135 and 91543111 (T Li).